As usual on the Tales classical music weekends, I like to reserve Sunday for some lighter soothing music appropriate for a restful Sunday. After a stressful week for a lot of us, a little soothing music can be very relaxing. The beautiful 3rd movement of Johannes Brahms Symphony #3 is just such relaxing music. 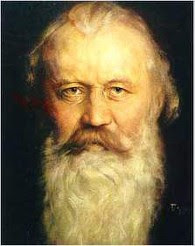 While the great Romantic master Johannes Brahms 3rd symphony is scored in F Major [meaning at least the first movement and usually the ending of the symphony will be in F Major], the 3rd movement, Poco Allegretto, is scored in C minor. Please turn up the volume sit back and enjoy this soothing Sunday music from the great Romantic Era composer, Johannes Brahms.